Wave Accounting vs QuickBooks Online Which Is the Right Choice? Wave Accounting vs QuickBooks Online: Which Is the Right Choice? Deciding which type of accounting software is best for your blossoming business? A good place to start is by comparing a major titan with a smaller, but still quite popular, option to see what you need and what price points are ideal. In this Wave Accounting vs. QuickBooks comparison review, we’ll go over their similarities and differences, pricing structure, features and customer reviews to give you a wider perspective. So, without further adieu, let’s get started! 1) Mobile Apps: Both accounting software companies have app versions that allow you to manage certain parts of your finances on the go. 2) User-Friendly: Their core software is relatively easy to learn and use. 3) Integrations: There’s a number of excellent 3rd party apps and widgets available for you to use to increase your accounting automation and functionality. 4) Reports: Gather important information on business finances by looking through their automatically generated reports. 5) Expense Tracking: Keep an eye on all of your expenses and upcoming payments with their expense tracking tools. 6) Bank Reconciliation: Connect all of your bank accounts and credit cards, and your balances will automatically sync and display on their software. 7) Invoicing: Create customizable invoices that reflect your brand and send them out with one click. 8) Collaboration: QuickBooks & Wave Accounting make it possible to collaborate on their platform and discuss all financial matters with other users. Wave allows you to set reminders for upcoming payments and transactions, which QuickBooks doesn’t have available yet. Their initial plan is 100% free and while it doesn’t have all of the features that QuickBooks offers, it’s extremely cost effective. They offer a good “Getting Started Guide” that explains how to use all of the features available to you. Wave gives you full ownership of all your information, while QuickBooks files this data into Intuit. They’ve recently partnered with OnDeck, so you can apply for a small business loan for your next project! QuickBooks offers you the choice between two excellent discounts when you sign up. You can choose between 50% off for the first 6 months or a 30-day free trial of their complete software. Overall, QuickBooks offers more features and tools to their members than Wave. These include credit notes, additional customization to invoices, and audit history features. Both QuickBooks and Wave offer two different types of packages. QuickBooks, like many others in the industry uses a tiered, subscription-based packaging system consisting of four packages ranging in the number of features available. They offer occasional deals like an Independence Day sale, where you can save even more so keep your eye out. With Wave’s free software, you’ll be able to send invoices, manage receipts, set up recurring payments and more. QuickBooks charges by feature, so depending on the number of features you need, you’ll choose packages accordingly. Remember, Wave manages your subscription based on a number of factors. If you find your business growing too big for their free offerings, you can add credit card processing for a small fee per transaction, or add payroll for a $15 base fee plus a $4 charge per employee you add to payroll. Both have done a great job in terms of collecting positive customer reviews and testimonials. We’ve pulled together their TrustRadius (TR) ratings so you can take a look for yourself! Wave does pretty well in comparison to others in the industry. They’ve gathered over 64 reviews, and have a total score of 8.1 out of 10 on this review platform alone, there are plenty of others like 68 reviews on FitSmallBusiness.com or 187 of SoftwareAdvice.com. 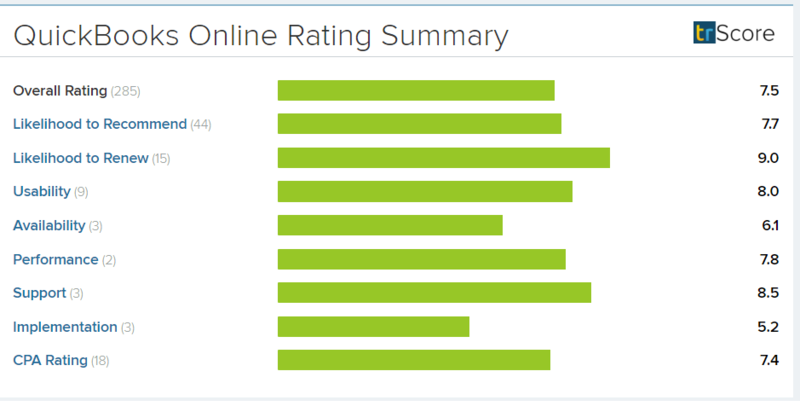 We’ve included a screenshot of their TR ratings summary below which goes through all of the important components. 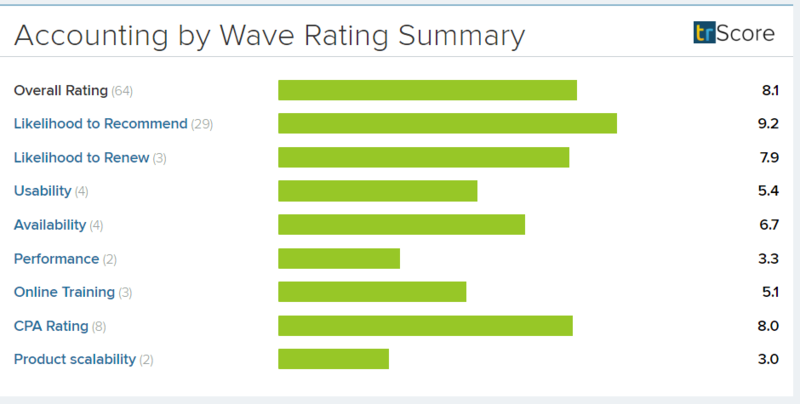 Wave receives great feedback overall, and users are likely to recommend and renew. They receive lower ratings for complaints revolving around product scalability because they don’t yet have some of the more involved features offered by companies like QuickBooks. 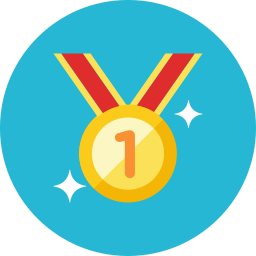 Their members were extremely likely to renew their subscription and praise them for their support, the usability of their software and their performance. We think this provides a good eagle eye view that represents the greater feedback out there. While we think both companies offer some fantastic features, QuickBooks gets our vote if you need more robust accounting to keep your business growing. For smaller, newer startups though, Wave Accounting could be a good fit. Use the links below to take your next step today, or continue researching your options. Cheers!